Intended for new developers, or at least new to ADO.Net, this post will demonstrate how to Create, Read, Update and Insert data into a MS SQL Server database. 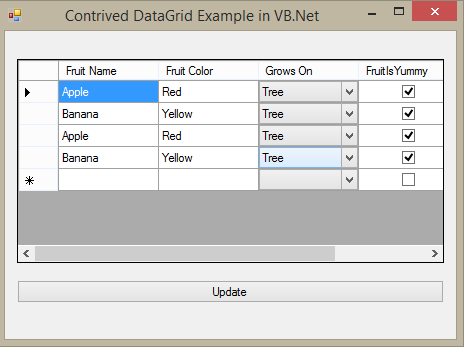 We will use a VB.Net winforms project, DataGridView and SqlDataAdapters. You can pull down the complete project from GitHub here. UPDATE: I have also published a similar example application done with Code First EntityFramework 6. Work with other encoder/decoders like gif, png, jpeg, bmp, etc.